Riley Kelliher chases after the ball. The senior defender and the Wildcats fell at Maryland on Friday. Since joining the Big Ten in 2014, the only conference team that No. 3 Maryland has lost to twice is Northwestern. Thanks to two dramatic overtime wins in 2014 and 2015, the Wildcats entered Friday night with the series lead over the Terrapins. Now, that lead is no more. The Cats (2-8-0, 0-5-0 Big Ten) conceded the opening goal 20 minutes into the match and saw the deficit double 19 minutes later — capping a dominating first half by Maryland (7-0-3, 3-0-2). One half later, NU exited on the wrong side of a devastating 3-0 loss and with the conference series evened at two apiece. Maryland dominated possession all night and manufactured 13 shots on goal against the Cats. Despite the many attempts, Maryland was unable to finish more than three thanks to strong play from junior goalkeeper Robbie White, who notched eight first-half saves to keep NU afloat. White began the game with an early save, denying Maryland midfielder Jake Rozhansky, who cut in from the right sideline. White was continuously alert throughout the game, coming off his line multiple times to smother breakaway attempts. But White couldn’t keep Maryland out of the net forever. After parrying a strong shot from Terrapin midfielder Amar Sejdic, White conceded a rebound from forward Sebastian Elney in the 20th minute. Maryland soon doubled its lead as Rozhansky finished a flat ball across the box from junior forward DJ Reeves. Sejdic scored the Terrapins’ third and final goal, converting off a penalty on sophomore defender Andrew McLeod. On offense, leading scorer Sean Lynch was unable to create many opportunities and spent most of the game chasing Maryland. In the rare instances the Cats got the ball, the Terrapins’ defense kept the midfield from linking up with the forwards. 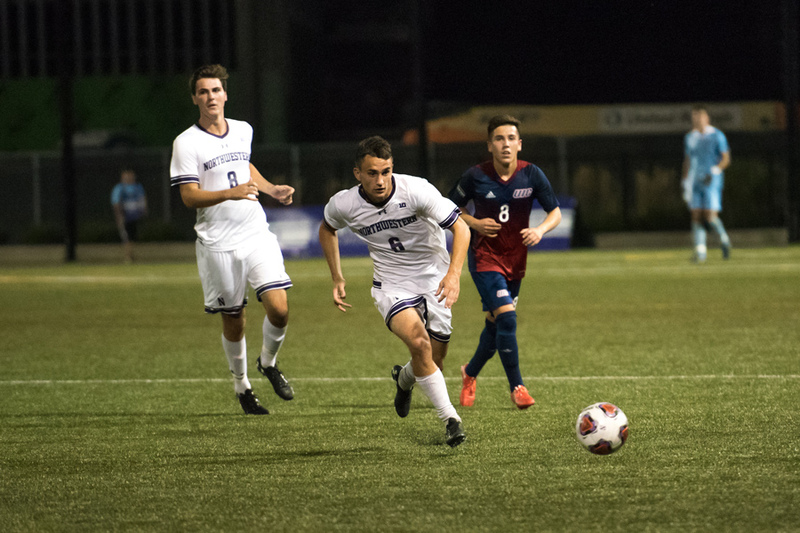 NU will look to overcome steep odds and bounce back Tuesday, when it concludes its road trip against No. 7 Notre Dame (6-2-1, 2-1-1).